Angelo Agrizzi, the former chief operations officer of controversial company Bosasa, says the company spent between R4m to R6m in bribes. The revelation was made before the commission of inquiry into state capture in Parktown, Johannesburg on Wednesday. Agrizzi also told the commission that when people employed by Bosasa, and outsiders, asked for money, Bosasa CEO Gavin Watson, who used to spend time in his office, would leave and later come back with a bag of money. He said the "bribe money" was kept in Watson's safe. Agrizzi said it was his duty to keep track of cash that was taken out of the safe. He used a little black book for this. "It is unlikely that 'Gavin's safe' was used for bribery," inquiry chairperson, Deputy Chief Justice Raymond Zondo, put to Agrizzi. "Yes, I know some of that cash was used for people's bonuses," Agrizzi replied, adding that Watson referred to the money as " monopoly money". Asked about the nature of the cash bribes and what the lowest and the highest amounts were, Agrizzi said the lowest was about R5 000 and the highest amounted to R1m. 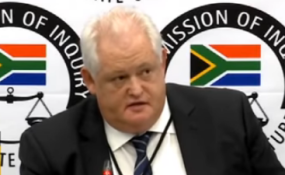 Agrizzi also told the commission about tenders Bosasa received from Sasol, the South African Post Office (SAPO) and Airports Company South Africa (ACSA). Referring to the Sasol catering tender, he said Watson had a meeting with Simon Mofokeng who was the head of the Chemical, Energy, Paper, Printing, Wood and Allied Workers' Union. He said Watson arranged with Mofokeng to put pressure on Sasol SA to ensure that Dyambu operations, which Bosasa was called at the time, would be awarded the tender. He said when Bosasa was awarded the tender, he arranged for the purchase and delivery of goods, such as "cold drinks and meat", to Mofokeng on a regular basis. Agrizzi told the commission he was responsible for the submission of a tender to provide security at post offices, which was awarded to Bosasa. Even before the tender was awarded to Bosasa, Watson issued an instruction that they needed to start logistical preparations to implement the contract. Agrizzi said it was a three-year contract, which was extended by two years. He said during the tender award, Watson mentioned two names - Siviwe Mapisa who was the head of security employed by SAPO and Mandla Manyatsi, who was at CEO of SAPO. He said Watson informed him that he was "sorting them out". He said the two used to receive gifts such as a Cartier pen, a Mont Blanc pen and cufflinks. He also told the commission that Bosasa was awarded a tender for handling the multi-storey parkade at OR Tambo International Airport. Again, Watson informed him that Bosasa would be awarded the contract, he said. He said Watson told him he was in contact with several ACSA officials - head of security at OR Tambo International Airport Jason Tshabalala, Siza Thanda and head of risk Thele Moema, who later became a key advisor to former Gauteng Premier Nomvula Mokonyane. After the contract was handed to them, he often accompanied Joe Gumede, who was a director at Bosasa, on official business, he said. He added that during these visits, they met with other individuals from ACSA and Gumede would hand them grey security plastics that allegedly contained money. "Grey plastic bags were handed to these and other officials at ACSA. The plastic bags were security bags, tamper-proof seals - in this case, not translucent. Cash would be packed in those bags and given to people," Agrizzi told the commission. Asked if money was not always visible, Agrizzi said the "way it was packed, you could see it was cash". "I later started arranging payments, which confirmed earlier suspicions that the ACSA officials were getting cash. "I had also received one of those bags (on a monthly basis) I knew what was in those bags," he said. Agrizzi told the commission that he decided to testify because "you become so engrossed with what is happening that you start believing that was is happening is right. I was blunt, I kept quiet and I should have exposed those illegal activities from day one." He added: "I had a near-death experience where I was admitted to hospital and I had a tumour in my heart and I was in a coma. "When I came out of the coma, myself and my family made a conscious decision that we would clean up where we had made mistakes before."